It's less than six weeks until Indietracks! Today's we're interviewing the Stoke-on-Trent punk pop duo Horowitz. Since forming in 2004 as a three-piece, the band has released a full-length LP ‘Frosty Cat Songs’ and numerous singles, memorably coining the slogan ‘Popkids of the World Unite!’ on the b-side of their 2007 debut 'Tracyanne'. Practically bleeding DIY ethics, the band have taken their infectious brand of noise pop to the US, Germany, Sweden, and Spain. In December 2010, Thee SPC released 'Popkids of the World Unite! ', a 17 track compilation collecting together the output of Horowitz between 2004 and 2009. This year the band released an EP 'The Knitwear Generation' on cassette on Fika Recordings, and appeared on the first release in the Odd Box 7" singles club alongside The Blanche Hudson Weekend. They return to Indietracks for the first time since their rousing performances at the summer festival in 2007 and the Christmas special in 2008. 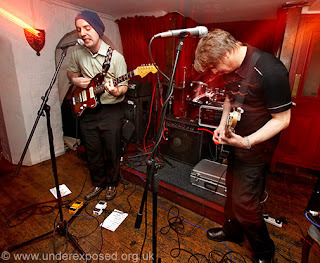 Pete: We're a compact two-piece guitar band but don't tell our drum machine and phantom bass player! We live in different cities and have been together for a number of years. Pete: The Sweet Nothings, The Wendy Darlings, Los Ingenieros Alemanes, Ace Bushy Striptease and One Fathom Down have been recent choices. The Sweeties' Subterranean Moseley Blues, She's An Accountant and Peace, Love And International Socialism are constantly in my head and a good dose of One Fathom Down's surf n punk n rock n roll is always a healthy tonic. Los Ingenieros Alemanes' 3" single (Memoria Historica and Lampan) is a great mix of indiepop and shoegaze; The Wendy Darlings' pure pop and the Ace Bushy slacker-indiepop are also near the top of the listening pile. Pete: We played in a flat in Gothenburg a couple of years ago, as part of a tour organised by our friend Pierre. Ian: My claim to fame is that I used to play football at school with somebody who has played at the World Cup finals, Christopher Birchall of Trinidad and Tobago. Pete: My sister recently contacted me to say that she spotted me on television, in the audience at a Suede gig in Stafford in the early 90s. Does that count as a claim to fame? Yep, especially as it's early Suede! What's going to be on your compilation tapes as you travel down to Indietracks? Pete: The Lost Summer Kitten and Lisa Bouvier tapes will probably get an airing in the car cassette player along with some punky/indiepop compilations. Ian: The Hidden Cameras! I think they are the perfect choice of headliner. Imagine the utter joy that will surely erupt if/when they play ‘Ban Marriage’. They played in Nottingham a couple of times maybe five years ago and were brilliant. The first two albums in particular are genius pop records I keep going back to time and time again. Pete: Lots of friends and a whole heap of ace bands. It's difficult to separate seeing bands from the communal Indietracks atmosphere, where being wrapped up in conversation can be equally as memorable as the listening to the music. It's hard to choose one band in particular but the thought of seeing Ace Bushy Striptease, The Garlands, Guatafan, Haiku Salut, History Of Apple Pie, Pocketbooks, Milky Wimpshake, The Sweet Nothings, Very Truly Yours, Remi, Zipper and The Wendy Darlings over one weekend is just brilliant. Brilliant - thanks Ian and Pete!